Dennis Wolf stands on a hill near the town of Dok To, Vietnam, where the former soldier says he saw his worst combat. When: Thursday, April 24, 7 p.m. Though the words may appear strikingly familiar, the reports are more than 30 years old. February 1969 – President Nixon authorizes Operation Menu, the bombing of North Vietnamese and Vietcong Bases within Cambodia, with U.S. forces eventually dropping more than a half million tons of bombs. South Vietnamese troops attack into Cambodia, pushing toward Vietcong bases. Two days later, a U.S. force of 30,000 – including three U.S. divisions – mount a second attack. Operations in Cambodia last 60 days, uncovering and capturing 28,500 weapons and over 16 million rounds of small arms ammunition. Although most Vietcong manage to escape across the Mekong, there are over 10,000 casualties. Wolf (at left) and other soldiers at their barracks near Pleiku. With conflict and war comes change, and Western Iowa Tech’s former Job Training Partners director Dennis Wolf has seen firsthand the horrors of war as well as the value of change. Le Mars native Wolf, who served as a combat infantry soldier with the Army’s 4th Infantry Division from 1969-70, journeyed late last year to the country of a conflict that took more than 100,000 lives. It was the first time Wolf had set foot in Vietnam in more than 33 years. The company barracks were later destroyed by the South Vietnamese. Wolf will focus on that trip and present-day Vietnam in a presentation held on Thursday, April 24, at 7 p.m. at Western Iowa Tech. The event is free and open to the public. “I will be talking about the impressions I gained from this trip and about the contrast from what I experienced in October and November of this past year to what my experiences were 33 years ago when I was there as a combat infantryman,” says Wolf, who will supplement the eras with his collection of slides. One particular slide features a modern-day image along Highway 19 – the exact location where the Pulitzer Prize-winning photo was taken of a screaming little girl running down the road after a napalm bomb attack. The bomb had destroyed all the coffee plants and vegetation; the area now has high-line poles, buildings, trees and other colorful foliage. A Montenyard village where Wolf was stationed for his last 5-6 weeks of duty. Other slides show the present Phu Cat base where Sioux City’s 185th were stationed during the conflict. The tunnel system where the Vietnamese war effort was headquartered. “It’s still an active base where they train pilots now,” says Wolf. One of Wolf’s favorite photos, however, is of him in Dok To in the central highlands on the edge of a firebase. It is the area where the former soldier says he saw his worst conflict. A Vietnamese family harvests rice. It was the same location, Wolf says, that Mel Gibson portrayed in the movie “We Were Soldiers,” and one of the few areas where Wolf knew for certain that he was in. 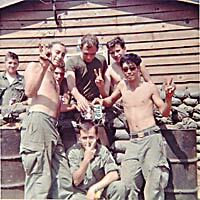 The current war in Iraq is reviving those emotions felt by some other former Vietnam vets. WIT’s Associate Dean of Instruction, Marcia Kuehl, is married to a former vet and sponsored Wolf’s first presentation at WIT on Jan. 31. Young Vietnamese boys hold up rats they’ve captured. An elaborate Kow Die temple. Wolf says the two wars are completely different conflicts, but admits he also had concerns about Iraq. Women in a market wait for customers. And, says Wolf, everybody in this country wants quick results. Wolf’s presentation bears witness not only to history and war, but also to progress and the ensuing change. 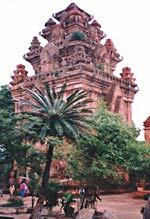 A memorial to soldiers in Ho Chi Mihn City, once called Saigon. This article first appeared in the Weekender on April 17, 2003.